SSH (Secure SHell) provides command-line access, so you can run commands directly on that machine. Shell access is the equivalent of the ‘command prompt’ on Windows PCs, or the terminal on machines running Mac OS X or Linux. SSH is an encrypted protocol, like SFTP, ensuring that any commands and passwords passing between your computer and the server are protected against eavesdroppers. 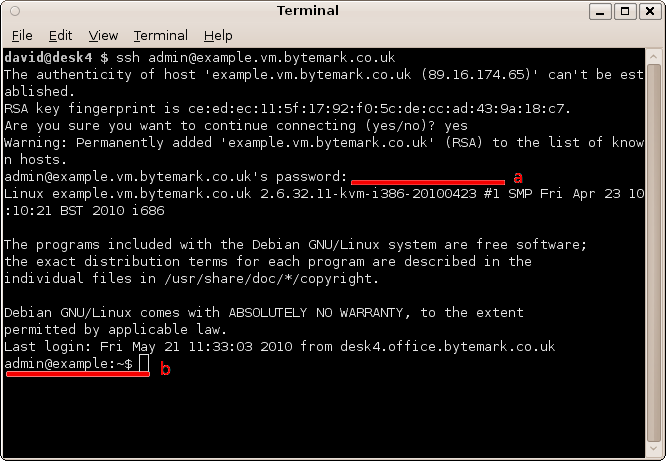 For Bytemark customers, SSH is also used to access the Recovery Console of the machine. Linux and Mac OS X desktop machines usually come with the SSH command available. The first time you connect to your machine you will be presented with a warning message about the authenticity of the host. We can assume that the host is authentic, so type yes and press Enter to continue. Enter the password for the ‘admin’ user (a) (it is normal for nothing to be displayed on the screen as you type) and press Enter. You will be presented with the admin@example:~$ prompt (b) ready to accept commands. Tip: When the machine is setup, the password for the root user, the admin user and the mysql database are all the same. 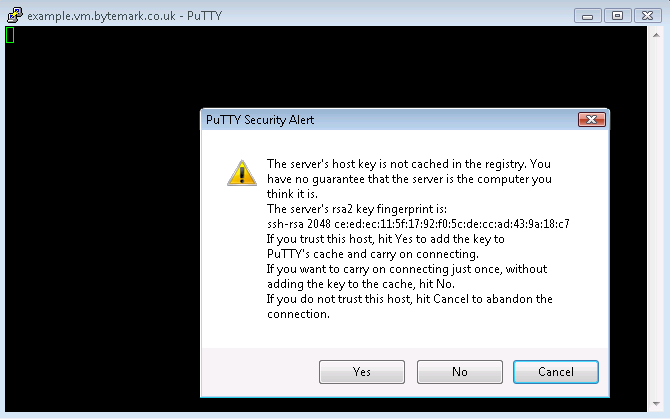 Start PuTTY. If you are running it on Windows and you get a Security Warning, click the ‘Run‘ button to continue. Enter your server’s host name in the ‘Host Name (or IP address)‘ field (a). Enter 22 in the ‘Port‘ field (b), and select the ‘SSH‘ radio button (c). Click the ‘Open‘ button (d) to start the connection. The PuTTY command window will open. The first time you do this, you will be presented with a Security Alert (warning that the key is untrusted). It is safe to click the ‘Yes‘ button to continue. 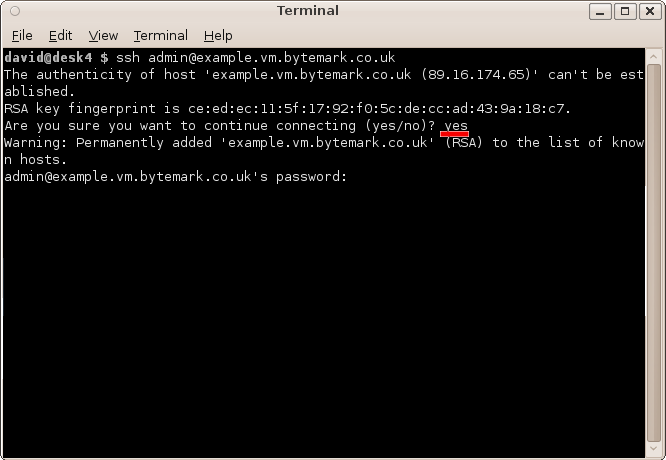 At the Login prompt, type admin and press Enter and the admin@example.vm.bytemark.co.uk password prompt will appear. Enter the password (it is normal for nothing to be displayed on the screen as you type) and press Enter. You will be presented with the admin@example:~$ prompt, ready to accept commands.